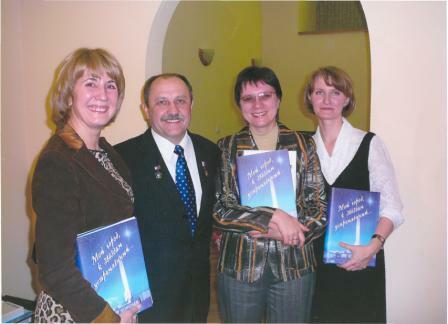 Yury Usachev is the most famous Russian cosmonaut. He is a remarkable person. He has experienced four space flights. Now he works in the city of Korolev and does a lot of volunteer work sharing his experience with the students of our city. Yury Usachev was born in Donetsk, Rostov in Don Region, Russia. He became a cosmonaut in 1989, was backup for MIR-14, 15 and 19, and then flew as a flight engineer on two flights to the MIR space station, including one with NASA’s Shannon Lucid. Usachev has been an F-16, F-15 weapons separation engineer with the Air Force Armament Laboratory, was assigned as an assistant professor of aeronautics at the U.S. Air Force Test Pilot School, where he graduated first in his class, and was awarded the R.L. Jones Award. Yury was assigned as a USAF Exchange Officer to the International Space Station Expedition 2. The station flying over Earth represents the overall reason for having a space station: to benefit the world through scientific research and international cooperation in space. The number "2" is for the second expedition and is enclosed in the Cyrillic MKC and Roman ISS, which are the respective Russian and English abbreviations for the International Space Station. The United States and Russian flags show the nationalities of the crew, indicating the joint nature of the program. The stars in the background represent the thousands of space workers, such as Yury Usachev, who, throughout the ISS partnership, have contributed to the successful construction of our International Space Station. 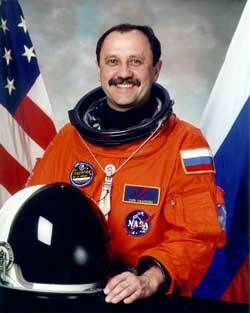 Usachev has flown three Space Shuttle flights: sts-101, sts-102 and sts-105. These Space Shuttle missions visited the International Space Station, as well as a Russian Soyuz human spacecraft with a visiting crew, and automated Russian Progress cargo supply craft. After his flights, Yury Usachev visited many countries and saw millions of people. He lives in our city of Korolev now. And he became a hero of our country. 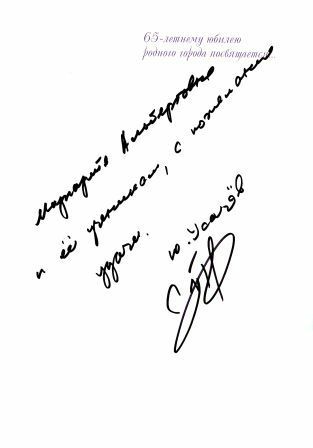 Here is his signature made on the book about the city of Korolev. It says: "For Margarita Astakhova and her students wishing good luck."